Malic acid is a naturally occurring, nontoxic organic acid, generally recognized as safe, and classified under food acids by the F.D.A. Malic acid plays an essential part in sugar metabolism and in the formation of ATP, the energy currency for physical activity and other body functions. Magnesium is second most abundant mineral in the healthy muscle, as well as other organs. All chronic pain sufferers, especially fibromyalgia sufferers, have a deficiency of magnesium. Magnesium is required in adequate amount for the normal activity of 300 enzymes including the transfer of energy from food to ATP and the transfer of ATP energy to physical and mental acitvity. Therefore adequate magnesium intake is essential for ATP production and action. Many factors influence your FM symptoms. The first step is proper diagnosis by a physician. The diagnosis not only rules out other conditions, it opens up the gates to treatment. 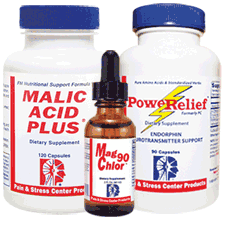 Our recommendation is a combination of 3 products that replenish your tired muscles, address nutritional deficiencies, and provide immediate pain relief: Malic Acid Plus, Mag Link, and PoweRelief. Mag Chlor 90 is a homeopathic alternative to Mag Link, and the highest concentration of magnesium without a prescription.